Stay compliant with electrical safety regulations in Oregon. Apply the State of Oregon Electrical Specialty Code (2014), based on the 2014 edition of the National Electrical Code® (NEC®). Electrical fire safety in Oregon depends on compliance with the State of Oregon Electrical Specialty Code (2014). Based on NFPA 70®: National Electrical Code (NEC), this up-to-date edition includes the full text of the 2014 edition of the NEC, as amended by the Oregon Department of Consumer and Business Services, Building Codes Division. The Code contains comprehensive regulations for electrical wiring, overcurrent protection, grounding, and installation. Usability features aid Electrical Specialty Code users in the field. Changes to the 2014 NEC other than editorial changes are highlighted with gray shading within sections. Where one or more complete paragraphs have been deleted, the deletion is indicated by a bullet (•) between the paragraphs that remain. To distinguish new Oregon additions, applicable text is underlined and the symbol "OR" appears in the margins of the Code. To distinguish new Oregon deletions, applicable text is struck through and the symbol "OR" appears in the margins of the Code. Keep people and property safe from electrical hazards with the 2014 State of Oregon Electrical Specialty Code. 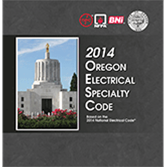 STATE OF OREGON 2017 SECTION ELECTRICAL SPECIALTY CODE is EFFECTIVE October 1, 2014 and authorized by ORS 479.730. Portions of this publication are reproduced with permission from the National Electrical Code, 2014 edition, copyright National Fire Protection Association, Quincy, MA 02169. No portions of NEC material may be reproduced except with permission of the National Fire Protection Association. Interested in older editions of the State of Oregon Specialty Electrical Specialty Code? Use the drop down menu above to select it.